Leah Raichik attends a June 10 dinner for Chabad-Lubavitch of Pasadena, where her daughter, Chani Hanoka, serves as co-director. 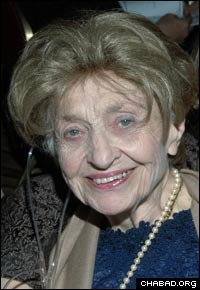 Leah Raichik, the widow of the first Lubavitch emissary to the West Coast and a champion of Jewish life in California, passed away on Aug. 8 due to heart complications. She was 78. Known as the "Bubbe of the Golden State," Raichik was intelligent, outspoken and knowledgeable, and a dedicated partner with her husband, Rabbi Shmuel Dovid Raichik, in laying the groundwork for the Jewish communities that would flourish in California through the ensuing decades. The rabbi died in 1998. In 1949, the Sixth Lubavitcher Rebbe, Rabbi Yosef Yitzchak Schneersohn, of righteous memory, sent the pair to Los Angeles to direct Chabad-Lubavitch activities on the West Coast. "We act as the Rebbe's fingers, going all over to spread Yiddishkeit. My husband was the shaliach," she once said modestly, using the Hebrew term for emissary. "I came because he came." 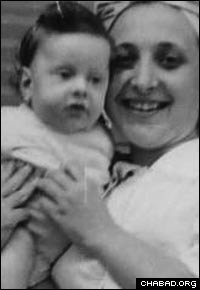 And although the comment was clearly an understatement of her role, Rabbi Shalom Raichik, one of the couple's 10 children, confirmed that his mother preferred more of a behind-the-scenes reputation while her husband traveled endlessly to support the growth of Yiddishkeit. "She considered it her responsibility to support her husband's activities," said Raichik, co-director of Chabad of Upper Montgomery County in Maryland. "I remember her criticizing at a women's convention the emphasis today on titles. She didn't need the bells and whistles." One of the Raichicks' first concerns upon establishing their home in Los Angeles' Fairfax section was educating the area's growing Jewish population about Torah observance. As Hollywood enjoyed its Golden Age, the husband and wife team focused their efforts on its residents' spiritual growth. "There were a lot of Jewish stores. Very few were closed on Shabbos," she told a documentary film crew about their drive to convince Jewish merchants to keep Shabbat. "In fact, there were none." From her modest home, Raichik generously fed the poor, lonely and wealthy with her Shabbat challah and roasted chicken. She also taught classes on Torah and Jewish law, hosted communal meetings and gave valuable advice on marriage and education. All the while, her own personal commitment to Judaism was manifest, even when near death. "I came to visit Mrs. Raichik in the hospital," relayed Rochie Stillman, a close friend of Raichik's and today a school mentor at the Cheder Menachem boys school in Los Angeles, "where she complained to me that it was 3 p.m. and she still had not prayed, due to hospital procedures and therapy. "She took her prayers seriously," added Stillman. "She would pray for two and a half hours everyday, saying every word clearly and concentrating on its meaning." Sultana Mayesh, a New York native who fortified her commitment to Judaism with the help of the Raichiks, said that Raichik's public and private good deeds did a world of good. "The current intensity of Jewish life is something you couldn't think about back then," explained Mayesh. "It was a spiritual wasteland. They created what we have now in size and strength by example and their own strength." "She was really an icon in the community," said Rabbi Boruch Shlomo Cunin, who moved to Los Angeles in 1965 and heads Chabad of the West Coast. "Her incredible commitment and warmth will be sorely missed." Born Leah Rapaport in the southern Polish city of Bielso-Biala, Raichik was the daughter of a wealthy and respected family of Gerrer Chassidim. Her father combined Torah learning with textile retailing and was able to provide a certain level of comfort to his family. But in 1939, when Nazi Germany declared war, Raichik fled her home with her mother and three sisters. They hid from Nazi forces for 18 months in a bunker under a barn, climbing out at night to breathe fresh air. Her father and 120 members of her extended family perished in the Holocaust. She immigrated to the United States at the age of 19 and married Menachem Shmuel Dovid Raichik, a Polish-born yeshiva student regarded as a Torah genius, in 1948. Upon hearing of the match, the Rebbe remarked that she was "a maven on quality." Shortly after their arrival, the Raichiks embarked on their tasks, with the rabbi traveling across California and out of state to reach out to Jews and build communities. His wife, despite the pressures of raising a family, dedicated herself to supporting him in his travels and became the de facto head of the household for much of the time. Soon, a constant flow of guests and visitors descended on the Raichiks' Los Angeles home on North Edinburgh street. "What they accomplished in this home really affected many people," said her daughter, Chana Hanoka, who serves as a program director for Chabad of Pasadena, Calif.
"It was a struggle," said son Yanki Raichik, a local advertising specialist and charity activist. "She [pasteurized] the freshly-milked milk herself and salted the chicken [to kasher it] if we had any. Once, we finally got one kosher slaughtered chicken and my mother said, 'Great, for the next six weeks we have chicken.' "
And yet, "Shabbos without guests was unheard-of," added the son. In time, it became somewhat of the norm for newly appointed Lubavitch emissaries to also seek out the Raichiks for guidance and inspiration. When Rabbi Naftali and Fayge Estulin arrived to the area in 1971 to head the Chabad Russian Immigrant synagogue, they were astonished by Raichik's activities. "Once you walked in that door, you were hers, under her wings," said Fayge Estulin. "People were drawn towards that house. At any given time – after midnight too – you could find a bowl of soup and an attentive ear. She had a strong sense of right. She was forthright and didn't waste smiles, and yet, she was the kindest and warmest person I knew." Rabbi Yehuda L. Ceitlin is the outreach director of Chabad Tucson, and associate rabbi of Cong. Young Israel of Tucson. He coordinates the annual Yarchei Kallah summit of Chabad scholars, and was on the editorial staff at Chabad.org.